On a quiet Wednesday evening, funk rock band L.A. Walkway are rehearsing for a set of upcoming gigs. Their brand of heavy rock/ funk music is audible from outside Dock and Roll, a small rehearsal space just outside Liverpool City Centre named for its location near Canada Dock. Inside is a small stage, its own instruments and even a bar and tables – it could easily be a pub, never mind a practice area for the band! When I enter Dock and Roll, L.A. Walkway are already hard at work rehearsing. 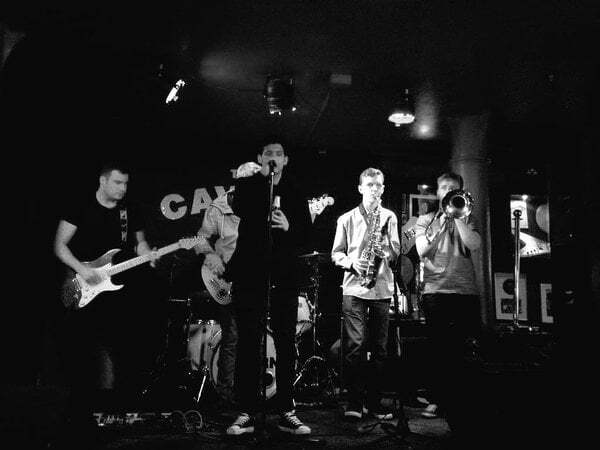 On stage is vocalist James Brougham, drummer Rob Downey, guitarists Mitchell Jenkins-Lind and Chris Smyth, and saxophone player Keiran Brannigan – unfortunately, trombonist Ric Kehoe couldn’t make the interview. They play me some new tracks, an eclectic mix of mostly upbeat material combining elements of funk, jazz, rock and pop. Afterwards, we sit down for a chat, starting off by discussing how the band formed. “Me and Mitchell used to be in a band, Call Off The Search, and we love what we made, but a lot of the music was just miserable” James states. In response, the two of them created some upbeat tunes on the side, foreshadowing the style L.A. Walkway aims for. When they played it to a Call Off The Search band member, the song was dismissed as “too pop”. Unsurprisingly, James and Mitchell were frustrated with that attitude. 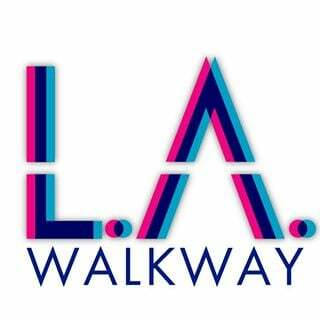 “We formed L.A. Walkway as a side project, but eventually it became our main priority” James explains. “We looked for other people to join the band, and on a site called Join My Band, we found Rob as our drummer. After that, we found Chris and Richard on the same site, and I knew Keiran already so we brought him in”. Naturally, this meant all of the members were musicians before the band. Rob has previously performed in blues rock bands (comparing this sound favourably with Led Zeppelin), while Chris’s background was in funk and rock and Keiran’s was in jazz. The band explained that their various musical background led to L.A. Walkway’s current sound, which they describe as “rock influenced 70’s disco”, “funk rock”, “Chic mixed with Earth, Wind & Fire”, and “70’s funk, modernized”. In Rob’s own words, “It’s all about finding everyone’s niche”. Their varying backgrounds also meant varying musical influences. Keiran’s appreciation of Earth, Wind & Fire and James’ interest in Maroon 5 emerge within both L.A. Walkway’s music and their musical past. What doesn’t emerge as clearly is Mitchell’s love for pop music, although he also stands his ground as a big Nirvana fan. “I love Kurt Cobain” he says defiantly. The slight pop influences are there, yet it doesn’t detract from the much heavier funk and rock sound; if anything, it careers more towards Maroon 5’s slightly pop-style rock. Don’t define them as a pop group though – as Chris states, “I don’t hate the genre or anything, I just don’t think our music is pop”. Their musical stance is clear, but what about their lyrical content? “For the first album, it’s experiences both good and bad with women” explains James. The group collectively channel their romantic endeavours into their music, but they make sure not to focus on the negatives. They highlight an upcoming track, ‘Falling’, which they call a “dedication to women”. They’re concerned some of their lyrical content focuses too much on hurt and pain, which has led to a focus on positivity and uplifting music. The conversation drifts towards the current Liverpool music scene, and they (briefly) hesitate. They don’t want to be negative, but they don’t want to stifle their views. “It’d be good to see some variety” James declares. One issue they’ve found as a band is that many of the local acts they’ve seen sound very similar to each other. Instead of elevating their own music, it gets lost in the blend of the more popular sound. “It’s hard to stand out” Chris says. Despite this, L.A. Walkway are proud of their versatility. Rob suggests that despite the band’s thoughts “there’s loads going on with music in Liverpool”. One thing they definitely loves about Liverpool’s music scene is Rock and Roll, the rehearsal space they’ve chosen to practice in. It’s not immediately recognisable as a rehearsal space from the outside, but close positioning to Bank Hall and Sandhills train stations make it easy to travel to. “It’s a good location” Mitchell rightly says. Each of the group have their own positive about the space – James loves the freedom they’re given (no staff are present during rehearsals), and Rob focuses on the stage and instruments present. “For me, it’s the casual feel” Keiran states, referring to the bar-like setting. It’s definitely a very casual location, as if our conversation should be accompanied by plenty of others drinking and chatting in the background. Moving on from the rehearsal space, the band discuss what venues they’d love to perform in. “I’d love to tour the O2 Academies” Rob says, while agreeing with Mitchell that outdoor festivals are the best way to go. For both upcoming and established bands, these places are common choices for performances, the kind where they’re likely to gain a lot of attention. In the past, L.A. Walkway have played in Liverpool venues such as Zanzibar and Constellations, both solid choices for the band. With a performance at The Deanes House pub in Prescot on April 10th, they may reach a different audience than at their past gigs. As our chat draws to a close, the band perform a few more songs, including previous single ‘Pretty Lady’. It’s a smooth number, both reminiscent of 70’s funk and conscious of current musical trends. With a re-emergence of groups such as Chic, their sound is very much in style right now, and ‘Pretty Lady’ is the closest the band has to a song which clearly outlines their identity. Despite this, it’s clear from their rehearsal and our chat that L.A. Walkway’s music stretches far beyond both current musical popularity and a single definable sound.